A hurried promise to a dying man lies at the heart of a remarkable book by one of the best new writers in Indie publishing today. 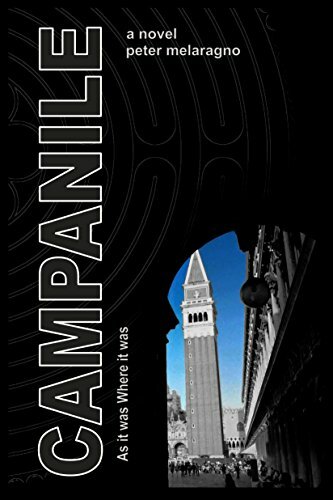 In Campanile, first-time author Peter Melaragno draws deeply on his Italian-American heritage to bring life and a wealth of color to his brilliantly drawn, yet achingly conflicted lead character, Ethan Canavaro. Ethan is haunted throughout the book by his pledge to return to a poverty stricken town in Mexico to rescue the granddaughter of a terminally ill acquaintance. For years afterward, the girl dances in and out of Ethan’s consciousness, alternating her appearance as either a wide-eyed young girl or a withered old woman. In reality, she is neither, having perished in the desert trying to reach the United States only months after Ethan left Mexico. Yet still the guilt lingers, decades after the fact. The novel traces Ethan’s subsequent journeys across many time zones and through many troubled relationships in search of solutions to questions both articulated and unspoken. Unforgettable characters appear, go away, and then reappear in a series of slow reveals that very effectively hold readers in suspense. What, for example, becomes of Ethan’s first professed love, Ariadne? Indeed, she haunts his thoughts almost as much as the unfortunate deceased granddaughter, Dina. And then there are the solid supporting male cast members as well, like old friend Victor, who knew Ethan’s equally troubled father, and kept a dark secret about him close for many years. There are many other players intersecting and crisscrossing Ethan’s past, present and future: Teodolinda, his widowed grandmother, whom he oddly wished had never left her village in Italy; flamenco artist, Maya, who figures subtly but importantly in the unfolding back story; and young, yet wise-beyond-his-years, Khalil, whose trusting friendship with Ethan may yet be his redemption. It was at just that moment of suspended mystery, a crossroad of hands, that Ethan found himself at a singularly pristine bend of life’s river. It is the pervading sense of dislocation that dogs him; the sense that no matter where he is or whatever he is doing, he is never where he is supposed to be. He reflects on how the perpetual motion of life seems to halt so cleanly at certain difficult beats, how emotional upheavals sink into memory as postcards rather than video. So, in the final analysis, as a reader, come for the crisp, polished writing. But stay for the book’s stunning conclusion in which much is made clear and one is left with deep satisfaction at a thoroughly absorbing piece of fiction from beginning to end. Five plus stars to Campanile. It is an impressive start to what we hope will be a long literary career.